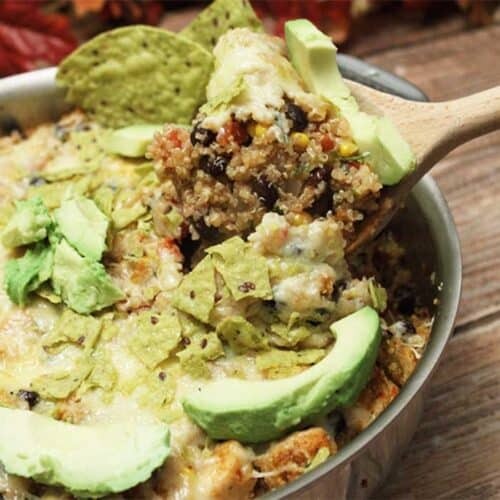 A quick, healthy all-in-one pan Mexican Quinoa Bake full of all the flavors you love - black beans, chicken, quinoa, salsa and cheese. All in 30 minutes! Bring quinoa and chicken broth to boil. Turn down heat, cover and simmer for 15 minutes. This step can be done earlier in the day or up to several days ahead of time. Cube chicken and toss with 1 tablespoon of taco seasoning. Place olive oil in a medium skillet and heat on medium-high. Add garlic, onions and jalapenos and saute for 1 minute. Add chicken and cook until chicken is almost done, about 5-6 minutes. Add remaining ingredients to skillet except cheese and garnishes. Stir well. Sprinkle cheese on top and bake in oven for 15-20 minutes. Garnish with crushed kale chips, sliced avocado then sprinkle with cilantro.